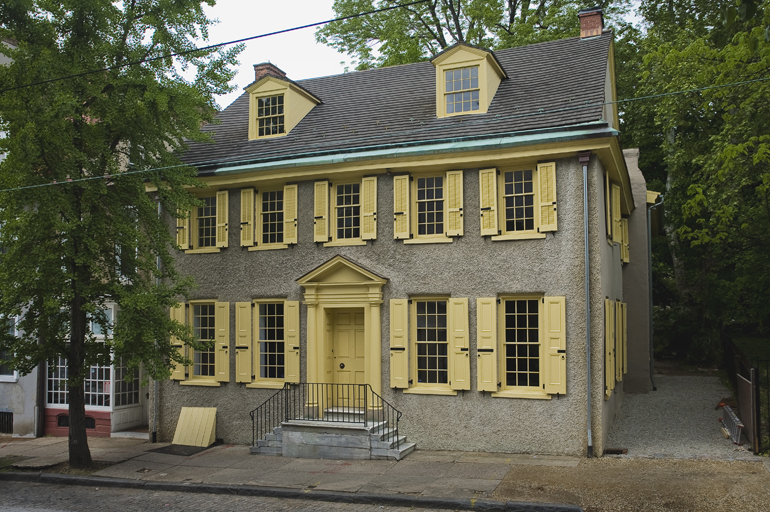 This building was the home of several illustrious Philadelphians and served as the residence of Thomas Jefferson during the Yellow Fever Epidemic of 1793. The original stone house dates from 1744; there were additions to the rear in 1798 and 1880. It is listed on the National Register of Historic Places. In the 20th century the building was adapted to a series of retail and residential uses. In the late 1960’s the structure was acquired by the Germantown Historical Society and configured to serve as a costume museum for the National Bicentennial (1976.) This use was short-lived and the building was neglected for more than 25 years. Our renovation involved righting many previous wrongs. This included the repair of deteriorated building fabric, the rectification of envelope issues, hazmat abatement, and structural reinforcement. New mechanical, plumbing, electrical, and communication infrastructures were installed. Planning and finishes were a collaboration between LDCP and Intellectual Property, LLC. LDCP provided construction management. The renovation conveys the atmosphere of the historic spaces while providing a flexible, contemporary workplace. The architecture seeks to balance past and present. Where historic fabric was present it was preserved; where new fabric was required, it contrasts with and/or defers to the historical context. A second stair to the attic was added late in the history of the house. The process of undoing was often stunning.